The latest collector coin from the United States Mint, the 2017-W Proof American Eagle Silver Coin, is now available for $53.95. The U.S. Mint released it today at noon Eastern Time. Adolph A. Weinman’s full-length figure of Liberty in full stride is featured on the silver coin’s obverse or heads side. The allegorical figure is wrapped in a flag, with laurel and oak in her left hand as her right hand extends forward. The image first appeared on 1917 silver half-dollars. Reverses depict John Mercanti’s heraldic eagle with shield. An olive branch appears in the right talon with arrows in the left. Get this latest product for collectors straight from the United States Mint via its website at www.usmint.gov (here’s a link to the bureau’s silver coins) or by calling 1-800-USA-MINT (872-6468). 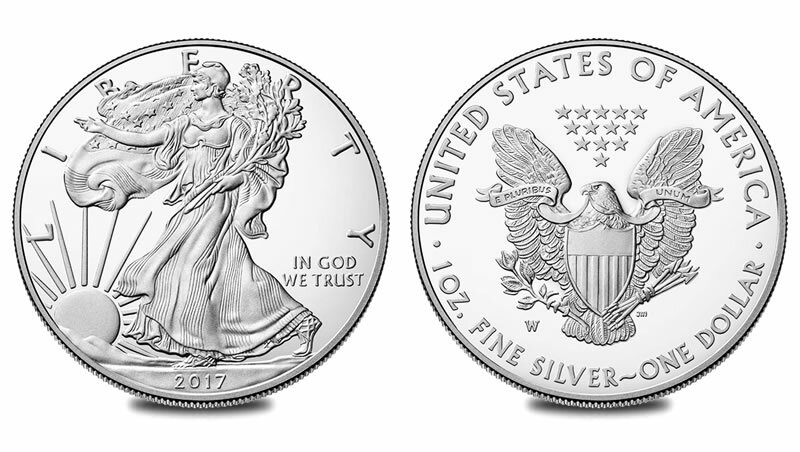 The companion 2017 American Eagle Silver Bullion Coin launched on January 9th through the U.S. Mint’s network of authorized purchasers. Its sales through Wednesday totaled 7,637,500 coins. They are available from coin and bullion dealers for a few dollars above their silver value. A release date for the numismatic 2017-W Uncirculated American Eagle Silver Coin is yet to be announced.